Creating quotes allows your customers to get an idea of what a project will cost and ensures that you and the customer are on the same page. Pro Tip: Remember that in order to receive a payment, the estimate must be converted into a job. 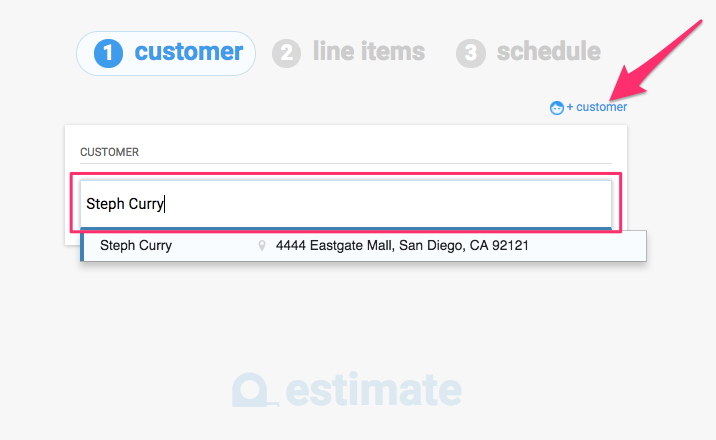 To create an estimate, click the green '+Add' button toward the top right corner of your screen. This will bring you to the three steps to enter all of the needed information. The first step is to enter customer information. Select an existing customer by typing their name/address/contact info into the search bar and selecting them from the drop down menu. For a new customer, click the '+customer' button to enter a new customer. The next step is to enter any necessary line items. Click the name field under Services and Materials to enter the items for the job, if desired. Remember, you can always leave these field blank and enter in items later on. Additional Services or Materials can be added by clicking the +Row button directly underneath the description. If you need to schedule out a visit to be ON SITE to do the estimate, move on the schedule tab. 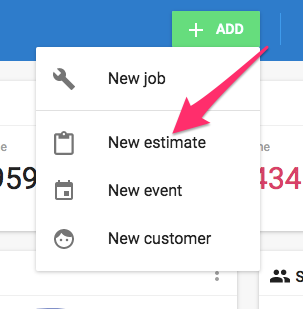 If you only need to compile the quote information and send it to the customer without scheduling a visit, click the green 'save' button at the bottom of your screen. When you click on the schedule tab, your calendar will appear where you can choose with date and time you'd like to schedule the visit to complete the estimate. Set your Estimate for the desired date, time and employee. Then click the green 'save' button at the bottom of the screen. Once the estimate is saved, you'll be taken to the estimate details page where you can update your estimate information as needed and send it out to the customer.